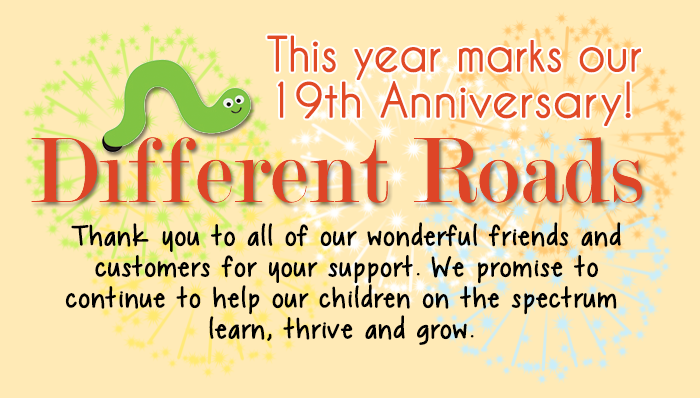 Since our inception in 1995, Different Roads to Learning has helped meet the needs of parents and professionals working with children on the autism spectrum. This year marks our 19th Anniversary, and we would like to say thank you to all of you, our wonderful friends, customers, and community. Our focus here at Different Roads to Learning is on the student with autism spectrum disorder, their teachers, and their families. We strive to give every young student on the autism spectrum the right tools they need to reach their highest academic and social potential. We would not be where we are today without the loyalty and referrals of our customers, so we thank you today for continuing to help us achieve our goal of helping you find the best learning tools for children on the spectrum. Here’s to a fantastic 19 years of business and many more in the future! Written by: Different Roads to Learning on June 27, 2014.on June 26, 2014. This entry was posted in autism and tagged 19th Anniversary, Different Roads to Learning, Special Announcements by Different Roads to Learning. Bookmark the permalink.